Hi, guys it's Qing and welcome back to my blog! So, Halloween is around the corner and I am so happy to announce that I have a giveaway for all of you! This is sponsored by Dresslily and the rule is just simple. 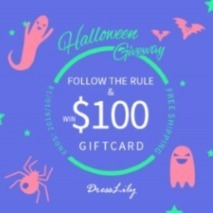 All you have to do is to share this blog post to all your social media like Facebook, Twitter, Lookbook, Instagram etc.. You have a chance to win $100 gift card by sharing to at least two (2) of your social media and send the links to blog@dresslily.com before Oct.18. Fifteen (15 ) Winners will be randomly chosen from October 19 to 23 by blog@dresslily.com. Following you now #243. Hope you can follow back. Congrats to the giveaway. Thank you for leaving the comment on my blog! I follow you now, hope you could follow me back! Hi Qing, thank you for visiting my blog and for leaving a comment. Yes I would like us to follow each other, I just started following you (GFC #246), so here's my blog as well. Thanks Rosh! would definitely followed you back! Yes, would love for us to follow each other. I just followed you :) Stay in touch. Yay! Will check it out! Thanks Beautilicious! Thanks Anna! Would love to follow you! Thanks Cvjetkovic! Will definitely check your giveaway! Sounds like a great giveaway! Thanks for stoping by and leaving a lovely comment on my blog. Thanks Gilda! Definitely follow you back! Thanks Milica! Would love to follow you! Thanks Emsi! Definitely will follow you back! yes I would like to follow each other, and I follow. I wait for you. do not let me links on my blog, please google sanctions. Thanks Benz and good luck!